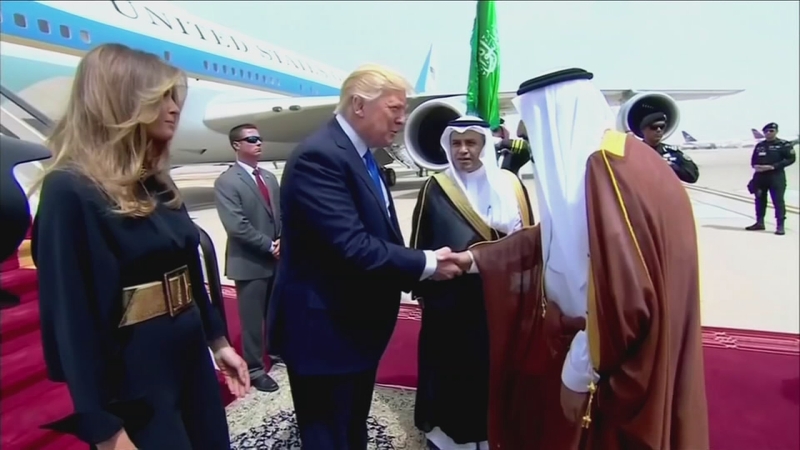 RIYADH, Saudi Arabia -- Ignoring President Donald Trump's past admonition, U.S. first lady Melania Trump did not cover her head Saturday when they arrived in Saudi Arabia on the opening leg of his first international tour since taking office. Two years ago, then-citizen Trump criticized then-first lady Michelle Obama's decision to go bare-headed on a January 2015 visit with her husband. "Many people are saying it was wonderful that Mrs. Obama refused to wear a scarf in Saudi Arabia, but they were insulted. We have enuf enemies," Trump tweeted at the time, including a short-hand spelling for "enough." Under the kingdom's strict dress code for women, Saudi women and most female visitors are required to wear a loose, black robe known as an abaya, in public. Most women in Saudi Arabia also cover their hair and face with a veil known as the niqab. But head coverings aren't required for foreigners and most Western women go without. While Mrs. Trump dressed conservatively Saturday in a long-sleeved, black pantsuit accented with a wide, gold-colored belt, her below-the-shoulder brown hair blew in the breeze at King Khalid International Airport in the capital city of Riyadh. She followed the example set by other, high-profile Western women, including Mrs. Obama. On visits earlier this year, British Prime Minister Theresa May and German Chancellor Angela Merkel also shunned head coverings. Then-first lady Laura Bush generally went without covering her head, though she once briefly donned a headscarf that she received as a gift. Hillary Clinton, on trips to Saudi Arabia as Obama's secretary of state, also did not cover her head. Trump's daughter, Ivanka, a senior White House adviser who is also accompanying her father, also left her head uncovered. Saudi Arabia adheres to an ultraconservative interpretation of Islamic Shariah law where unrelated men and women are segregated in most public places. Women are banned from driving, although rights advocates have campaigned to lift that ban. Guardianship laws also require a male relative's consent before a woman can obtain a passport, travel or marry. Often that relative is a father or husband, but in the absence of both can be the woman's own son.